"Artist Julie Schenkelberg began working on her entry for this year's ArtPrize in earnest on Friday, June 3, when she watched a moving company pick up and move a two-story house into place on Rumsey Street SW. The two-story frame house was moved across the back lot from Franklin Street SW, where it has stood since 1910. 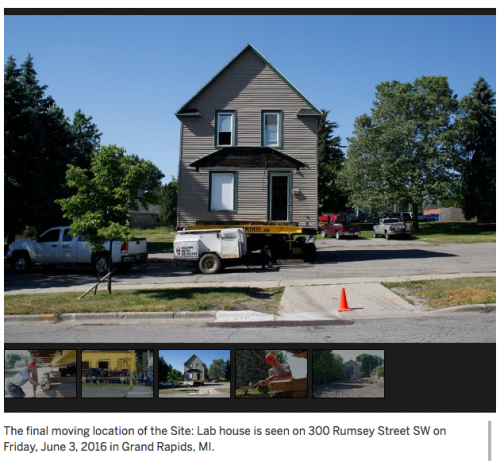 The house is part of SiTE:Lab's Rumsey Street Project, a 3-acre site that won the ArtPrize 2015 Outstanding Venue Award." "ArtPrize 2016 is a little more than three months away -- and one artist's work is already drawing some attention. Julie Schenkelberg is transforming a house into a sculpture. The piece is titled, "TransMigration."